I wouldn't be surprised if this was retribution against Israel for daring to support the Likud. And this is what happens when much of the UN councils are now dominated by Islamofascists. “There were some 50 or so Democrats that decided they would boycott (Netanyahu’s) speech. ... I don’t understand how Jews in America can be Democrats first and Jewish second and support Israel along the line of just following their president,” King told Boston Herald Radio yesterday. Anti-semitism is certainly still a problem everywhere, and those Democrats, Jewish or otherwise, who boycotted the speech, are failing to combat it by staying away from a speech that's meant to help them. I WILL NEVER BUY ANTHER STARBUCKS EVER AGAIN. A Democratic bill unveiled this week would allow former convicted felons released from prison to vote in federal elections. The measure would create a uniform federal standard applicable to ex-felons who are no longer in prison. It would not apply to state elections. Rep. John Conyers (D-Mich.), the top Democrat on the House Judiciary Committee and lead sponsor of the bill, said it would help former criminal offenders reintegrate into civil society. He also noted that preventing former prisoners from voting disproportionately affects racial minorities. Nearly six million Americans cannot vote because of a felony conviction. AKA: THE DEMOCRAT PARTY BASE! REUTERS: OBAMA BREAKING HIS PLEDGE TO "ALWAYS HAVE ISRAELS' BACK"
(Reuters) - U.S. President Barack Obama, who once famously said he would “always have Israel’s back,” may be rethinking that promise as aides begin weighing options in response to Prime Minister Benjamin Netanyahu’s pre-election disavowal of a two-state solution to the Middle East conflict. Following Obama’s warning that the United States would “reassess” its relationship with Israel, the administration is not only reconsidering the diplomatic cover it has long given Israel at the United Nations but is also looking at a range of other possibilities to put pressure on its historically close ally, U.S. officials said. Those could include becoming less active in protecting Israel in international forums and finding new ways to reinforce the message of U.S. opposition to Jewish settlement expansion. As internal discussions proceeded on Friday, the White House appeared in no rush to lower the temperature in the worst U.S.-Israeli crisis in decades, sparked by Netanyahu’s campaign declaration that there would be no Palestinian state on his watch. WE'RE IN THE MIDST OF THE WORST USA-ISRAELI CRISIS EVER BECAUSE THE ISRAELI ELECTION DID NOT GO THE WAY OBAMA WANTED IT TO GO. IT MEANS THAT OBAMA ONLY HAS ISRAEL'S BACK IF ISRAEL DOES OBAMA'S BIDDING. BUT REMEMBER, MOST OF THE CONGRESS AND MOST AMERICANS AGREE WITH ISRAEL AND DO NOT SUPPORT OBAMA ON THIS ISSUE, OR ON HOW OBAMA IS HANDLING THE IRANIAN NUCLEAR PROGRAM. I EXPECT OBAMA TO UNLEASH A TORRENT OF ALINSKYITE TACTICS AGAINST BIBI AND ISRAEL. AND THE MEDIA WILL PLAY ALONG. UNTIL A BRAVE BIGTIME DEMOCRAT RISES HIS VOICE AND ASKS OBAMA IS HE HAS NO SHAME. IS THERE ONE WHO IS BRAVE ENOUGH TO JOIN BOB MENENDEZ IN DIRECTLY CRITICIZING OBAMA ON HIS IRAN AND ISRFAEL OLICY? WILL SCHUMER? WILL FEINSTEIN? WILL OMALLEY OR WEBB OR WARREN? WILL BILL CLINTON? THAT WAS THE POINT OF THE ANNOUNCEMENT OF THE DOJ'S MENENDEZ INVESTIGATION. CROSS OBAMA AND HE WILL COME AFTER YOU. THE CHICAGO WAY. WILL THIS ANTISEMITIC PRO-MUSLIM BROTHERHOOD THUG GET AWAY WITH IT? The Justice Department is defending former Secretary of State Hillary Clinton from a motion to subpoena her private emails under the Freedom of Information Act (FOIA). “Such action is unnecessary and inappropriate under FOIA,” DOJ officials wrote in a legal briefing filed Thursday. Officials were responding to a case launched by Larry Klayman, the founder of the conservative watchdog group Freedom Watch. Klayman is asking the U.S. Court of Appeals in Washington, D.C., to subpoena Clinton’s computer server where she housed the private email address she used while serving in the State Department. Clinton has turned over 55,000 pages of emails that she believed could be considered official government communications, but she deleted 30,000 emails that she considered to be personal. The Justice Department describes Klayman’s call for a subpoena as “speculation” in its brief. “Plaintiff provides no basis, beyond sheer speculation, to believe that former Secretary Clinton withheld any work-related emails from those provided to the Department of State,” the agency says. The filing, first reported by Politico, is the first time that the Justice Department has addressed the government’s role in accounting for Clinton’s private emails. HILLARY CLAIMS SHE DELETED HER PERSONAL EMAIL. THE FACT THAT THE DOJ IS DEFENDING HER MEANS THAT THE OBAMA ADMINISTRATION KNOWS THERE MUST BE NASTY CRAP ON THE SERVER AND THEY WANT TO KEEP IT OUT OF VIEW. THE FACT THAT HILLARY ONLY HANDED-OVER PRINT-OUTD OF THE EMAILS TO THE STATE DEPARTMENT ALSO PROVES SHE HAS SOMETHING TO HIDE; BY DELIBERATELY NOT GIVING THE ELECTRONIC/DIGITAL FILES SHE PREVENTS SEARCHING AND LOOKING FOR EMBEDDED THINGS AND PROOF THINSG MIGHT HAVE BEEN ALTERED. - UNLESS WHAT SHE HAD TO HIDE WAS INCREDIBLY INCRIMINATION, PROBABLY TREASONOUS. SHE DESERVES TO BE RAKES OVER THE COALS, INTERROGATED, INDICTED, TRIED, CONVICTED - AND EXECUTED FOR TREASON. (Reuters) - Islamic State has published a video purporting to show the beheading of three Kurdish peshmerga fighters in northern Iraq by militants who threatened to kill "dozens" more of those being held captive. (Reuters) - At least 46 people were killed when four suicide bombers blew themselves up in two mosques in the Yemeni capital Sanaa during Friday prayers, security and medical sources told Reuters. AND OBAMA WANTS THESE PEOPLE TO GET ANOTHER STATE RIGHT NEXT TO ISRAEL!?!?!? YUP: OBAMA WANTS TO DO TO ISRAEL WHAT HE DID TO EGYPT - AND SYRIA AND IRAQ AND LIBYA: CONSIGN IT TO ISLAMO-HELL. SISI FOUGHT BACK AND WON, SO DID BIBI. OBAMA IS NOT FOR PEACE; HE'S ON THE OTHER SIDE. 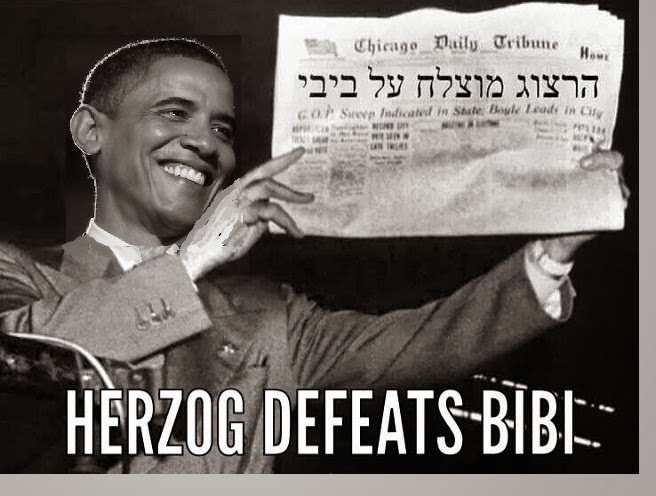 OBAMA SEEKS REVENGE ON ISRAELI VOTERS' REJECTION OF HIS POLICIES? Obama officials must now decide whether more international pressure on Israel can help bring a conservative Netanyahu-led government back to the negotiating table with the Palestinians — or whether such pressure would simply provoke a defiant reaction, as some fear. Obama has other diplomatic options. He could expend less political capital to oppose growing momentum within the European Union to impose sanctions on Israel for its settlement activity. More provocative to Israel would be any softening of Obama’s opposition to Palestinian efforts to join the International Criminal Court, which the Palestinian Authority will formally join on April 1. Under a law passed by Congress, any Palestinian bid to bring war crimes charges against Israel at the court will automatically sever America’s $400 million in annual aid to the Palestinian Authority, although some experts suggested Obama could find indirect ways to continue some funding — even if only to prevent a dangerous collapse of the Palestinian governing body. In other words, he'd be fine with the PLO making war crimes accusations? Sigh. Very galling if so. As will any attempt made to let the PLO continue to rob money from taxpayers. Thank goodness if the Israeli government won't just sit around waiting for this scenario to actually happen, and it's fair to guess they won't. WHY IS JAVAD ZARIF - IRAN'S CHIEF NEGOTIATOR - ALWAYS SMILING? So the rumors last month were true: Six thousand centrifuges will continue to spin, which is supposedly a great victory for the U.S. since it would mean — assuming Iran isn’t covertly operating even more centrifuges under the UN’s nose — that Iran would need a solid year to “break out” and refine enough uranium to power a nuclear bomb. Which means Barack Obama would have a year to prepare and execute a U.S. attack on Iran’s nuclear facilities to stop them. Oh, minor footnote: Barack Obama’s never going to attack Iran’s nuclear facilities. Ever. And both sides understand that. After the deal expires [in 15-20 years], Iran could theoretically ramp up enrichment to whatever level or volume it wants. So Iran gets to keep enriching, maybe gets to keep using its heavily fortified Fordow facility, gets to keep perfecting its ICBMs while all of this is happening, and then is free to get crazy with the nuclear cheez whiz in 15 years — and amid all this, a variety of American and international sanctions would be gradually relaxed. In return for all that, the U.S. gets a handful of magic beans. THE FREE WORLD NEEDS LEADERS WHO WILL DEFEND FREEDOM. RIGHT NOW, IT LOOKS LIKE UKIP IS THE KINGMAKER WITH MORE SEATS THAN THE LIB DEMS. AND THE NATIONAL FRONT IS LEADING IN FRANCE. AND TODAY, WILDERS MAY HAVE TIED FOR FIRST - THOUGH THAT'S NOT HOW THE MASS MEDIA IS SPINNING IT. IF THE CURRENT "LEADERS" REMAIN IN POWER - MERKEL AND CAMERON AND HOLLANDE AND ANY DEM IN THE USA, THEN THE FREE WORLD DOESN'T HAVE MUCH TIME LEFT. THE RIGHT-WING NEEDS TO GET AS AGGRESSIVE AND AS ASSERTIVE AS BIBI DID. AS REAGAN DID WHEN HE TROUNCED THE LEFT. WALKER. CRUZ. PERRY. THEY ALL WORK FOR ME. WOW: BIBI MIGHT GET 67 OR 68 SEATS IN HIS COALITION! BIBI DID WHAT MCCAIN AND ROMNEY COULDN'T - BEAT OBAMA! BBC: The public prosecutor in Brazil has formally charged the treasurer of the governing Workers' Party, Joao Vaccari, with corruption. Another 26 people were charged in relation to the massive corruption scandal at the state-owned oil company Petrobras. The move comes a day after hundreds of thousands of people protested in cities across Brazil against corruption. Many demanded the impeachment of President Dilma Rousseff. THE LEFT THERE IS LIKE THE LEFT IN THE OLD USSR AND IN CURRENT RED CHINA: A MASS OF CORRUPTION. LEFTISTS ARE ELITIST SCUM WHO THINK THEY CAN GET AWAY WITH ANYTHING BECAUSE THEY ARE MORALLY SUPERIOR. ON A SMALL SCALE THIS LEADS TO LEAR JET LIBERALS LECTURING US ABOUT THE IMPENDING GLOBAL CLIMATE CATASTROPHE. ON A LARGE SCALE IT IS RED CHINA. STATIST REGIME LEADS TO BIGGER GOVERNMENT ND MORE OPPORTUNITY TO STEAL. BOTTOM-LINE: THERE SHOULD BE NO GOVERNMENT OWNED OIL COMPANIES. Mr Barzani was clearly furious that the Shia militias - as well as the administration in IS-held areas - were being paid by the government in Baghdad while it was withholding budget funds from Kurdistan and its Peshmerga forces battling IS, the BBC's Jim Muir in northern Iraq says. "They [Iraq's government] are paying Mosul, they are paying Anbar [province], which are under the control of ISIS. Why aren't they paying Kurdistan, who is an ally? We are fighting a common enemy, how come we are not getting the appropriate support?" The central government in Iraq has not been funding Kurdish areas in the north because of an oil production row. Aaron Klein, an Israeli journalist, first reported on the Abraham Fund’s Arab get-out-the-vote initiative last week, and noted that the group had received State Department funding in the past. That prior grant for $999,000 expired in 2013. Thank goodness this whole scam was exposed before it could do any damage. BIBI & LIKUD GET 30 SEATS! HERZOG A MERE 24! 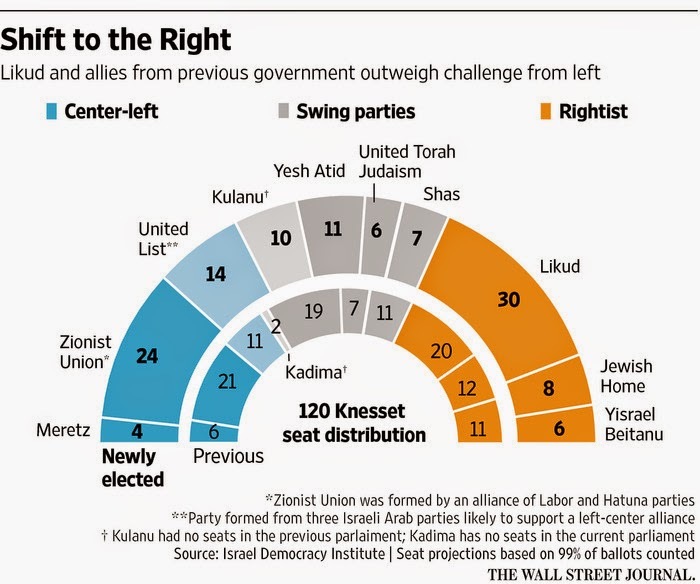 Likud leads with 30 Knesset seats. The preliminary results of the election are in, and on Channel 1 in Israel, it's a tie between Likud and Labor, although on Channel 2, the Likud has a slight lead. And for now, I'll have to admit, this is relieving. The Likud certainly worked hard, and it's paid off pretty well. The full results have yet to come in though, and we'll see how well it turns out then. Update: here's more on Times of Israel. ARE OBAMA ND V15 STEALING THE ISRAELI ELECTION WITH VOTER FRAUD? THEY DID IT HERE IN 2012 AGAINST ROMNEY AND IN 2008 AGAINST HILLARY ON SUPER TUESDAY. In 1999, he [HERZOG] was also investigated in the 'Amutot Barak' scandal (a scandal involving allegations that the party funding law was violated), but maintained his silence, similar to the American "pleading the 5th". The Attorney General, therefore, decided to close the case against him due to lack of evidence. Today's the fateful day where once again, Israel has to go to vote in elections. I've already cast my vote for Likud, and hope it'll help. Netanyahu explained that during his tenure, he has refused to “give in” to international organizations and hostile states that have demanded Israel retreat to its 1967 borders—a position which many have deemed militarily indefensible. “We stood fast against huge pressure, and we will continue to do so,” he added. Last week, Netanyahu expressed worry that a future Palestinian state, governed by its current leadership, would ultimately end up being heavily influenced by state sponsors of terror such as Iran or Sunni jihadi terrorist groups like the Islamic State. “Any evacuated territory would fall into the hands of Islamic extremism and terror organizations supported by Iran. Therefore, there will be no concessions and no withdrawals. It is simply irrelevant,” the Israeli Prime Minister told a Likud Party rally last week. The “two-state solution” for peace—which is the only platform largely supported by the international community—has shown to be a complete failure in securing peace for both Israel and the Palestinian people. So let's hope all voting today understand the seriousness of the issue, and that they won't vote for Moshe Kahlon's Kulanu party if they're willing to join a left-wing coalition. ... AND HE TOOK HIZBALLAH OFF THE TERROR LIST. BASICALLY, OBAMA WANTS ISRAEL TO DISAPPEAR. For some Palestinians, the election is not about removing Likud leader Benjamin Netanyahu from power. Rather, it is about removing Israel from the face of the earth and replacing it with an Islamist empire. The next Israeli government will face a two-pronged attack on the Palestinian front – one from the Gaza Strip, where Hamas and Islamic Jihad say they have just completed preparations for the next conflict with Israel, and another from the West Bank, where the Palestinian Authority (PA) says it is determined to pursue its “diplomatic war” against Israel in the international arena. You can be sure it makes little difference who wins the election this time; the PLO is laying out the groundswork for another jihad against Israel. This is becoming a very dangerous time. Throughout this short and ugly election campaign, Herzog and Livni have purposely flown under the public's radar. Zionist Union strategists have particularly tried to hide Livni, who once told ABC News that a Palestinian who attacks IDF soldiers is not a terrorist. This is similar to a statement made by a spokesperson for the Joint Arab List, which has turned into a natural partner for the Zionist Union. If the Labor party is elected in these next two days, it'll be truly awful, if that's how this awful woman thinks. In this advertisement (via Real Clear Politics), actor Voight gives his backing to Netanyahu in the election on Tuesday, says Obama doesn't love Israel, and wishes the best for Israel. Netanyahu was also, of course, a prime speaker at this rally and did well too. What's been seen today is very impressive, and let's hope it translates into success at the ballot box too on Tuesday. Update: The Jewish Press says there were plenty of secular people attending too. Update 2: here's some overhead pictures of the massive rally taken from a helicopter. Hillary's email scandal broke on 3/2.